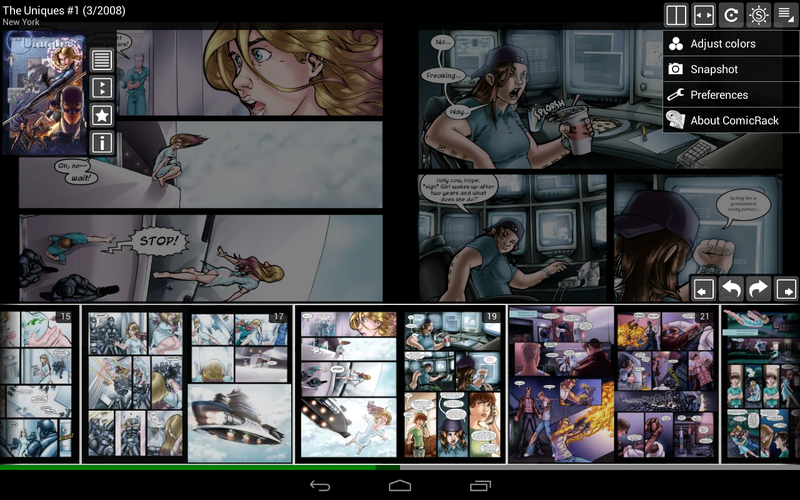 ComicRack for Android is the companion for the best eComic Reader and Manager for PCs: ComicRack for Windows Optimized for phones and tablets it allows you to read your eComics anywhere you want. 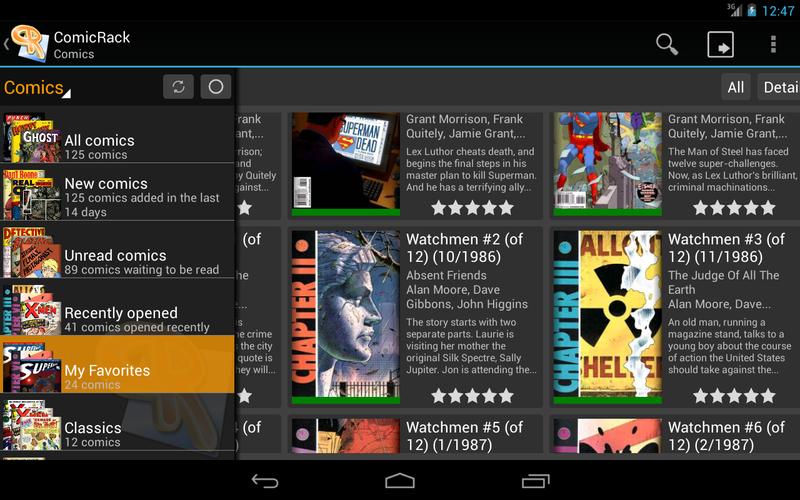 When used together with ComicRack for Windows it allows automatic synchronization of eComics with your Android device via USB or WiFi, including reading positions, reading lists and bookmarks. Your synchronized eComics will also be converted and optimized so they can be read fast an reliable on your handheld device. And best of all, this way you can read all the formats ComicRack for Windows supports (PDFs and even WebComics). Optionally the eComics can even be size optimized during synchronization which usually makes them half the size without noticeable quality reduction. 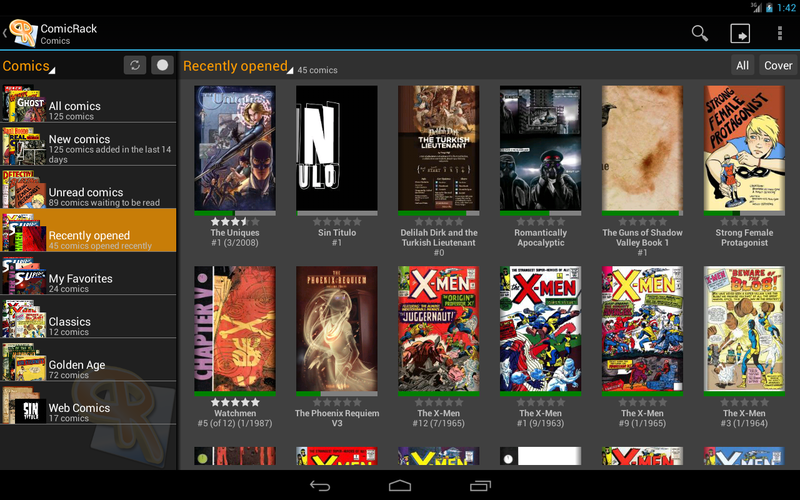 ComicRack includes a Live Wallpaper that shows random covers from your library. You can even start reading by double tapping the background. 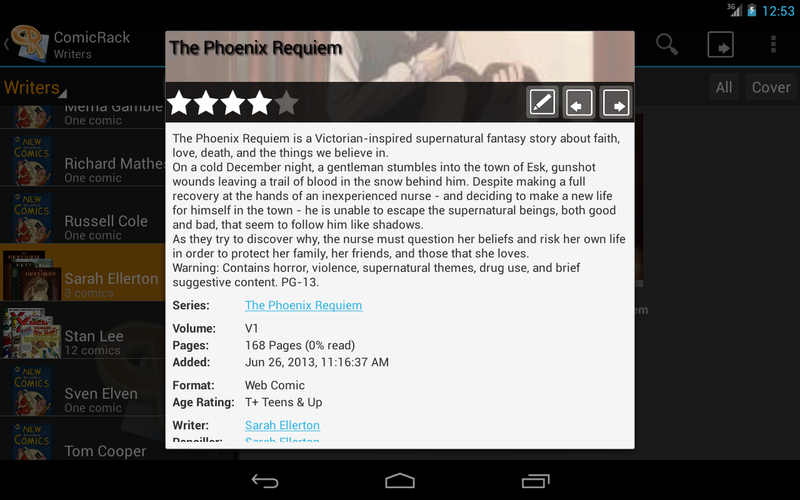 ComicRack also includes an App Widget to show your library on your home screen. The paid version removes all the ads and adds wireless synchronization. So you no longer need to connect your device to your PC to get your eComics from ComicRack for Windows. 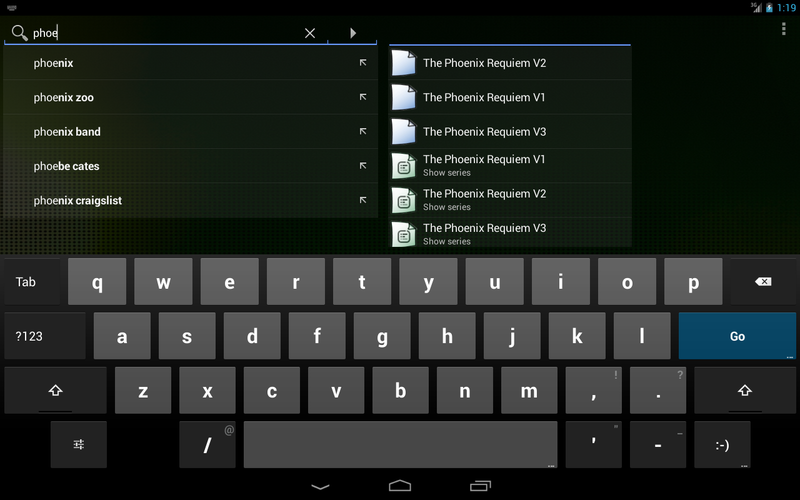 You can even invoke a synchronization directly from your device and your PC will send you all the new eComics from your lists. Before buying please try the free version first and see if it works as expected on your device. After buying, please use your 15 minutes return window to check out if everything works. Short feature list: • Optimized for phones and tablets • Reader with single and double page viewing • Advanced zoom modes • Auto scrolling • Right to left reading mode for mangas • Color adjustments • Automatic page cropping for small devices • Full library management with lists and searching • Management of reading states (unread, completed, bookmarks etc.) • USB and Wifi synchronization with ComicRack for Windows • Reads CBZ and CBR natively • When used together with ComicRack for Windows it supports CBZ, CBR, CB7, CBT, PDF, DJVU and WebComics • Live Wallpaper • App Widgets • Twitter integration Troubleshooting: While you can have the free and the paid version installed at the same time, it is best to uninstall the free version. Should you have problems with WiFi follow the tips provided in the FAQ and online documentation. If you want to use your external SD Card to store Comics on Android 4.4 and above, please follow the the guide in the FAQ. If you experience any bugs it is best to post your problems in the appropriate section of the user forum. Online Resources: Documentation is located at <a href="https://www.google.com/url?q=https://www.google.com/url?q%3Dhttp://comicrack.cyolito.com/documentation/comicrack-for-android%26sa%3DD%26usg%3DAFQjCNFu13qjwKYA6U8H0rZDBzBW1YBNHA&sa=D&usg=AFQjCNHaUCDLM9Nr7MpSJGj31T8hKpVo0Q" target="_blank">http://comicrack.cyolito.com/documentation/comicrack-for-android</a> FAQ is available at <a href="https://www.google.com/url?q=https://www.google.com/url?q%3Dhttp://comicrack.cyolito.com/faqs/comicrack-android%26sa%3DD%26usg%3DAFQjCNGaUfD2PtK8lgPN6loTf6qeiAMjDQ&sa=D&usg=AFQjCNGk0brN6gGGtvDlToAm8NA3fmj2ew" target="_blank">http://comicrack.cyolito.com/faqs/comicrack-android</a> User and Support Forum is at <a href="https://www.google.com/url?q=https://www.google.com/url?q%3Dhttp://comicrack.cyolito.com/forum%26sa%3DD%26usg%3DAFQjCNHFtfSyFXN-edq7ihSw9rz4wfCteA&sa=D&usg=AFQjCNHXgzN7T5ZuHowQLcZN7uFmZRdmhA" target="_blank">http://comicrack.cyolito.com/forum</a> Even if you have no problems you can join and talk to other ComicRack users.  Is ComicRack yours? Claim it!